Experience an exceptional ski region from early December to mid-April when skiing on the Arlberg. The next Flexenbahn cable car running from Alpe Rauz to Zürs is the first ever to connect ski regions from Tyrol and Vorarlberg from winter 2016/17. This new one and three more cable cars now make all the Arlberg villages accessible on skis. 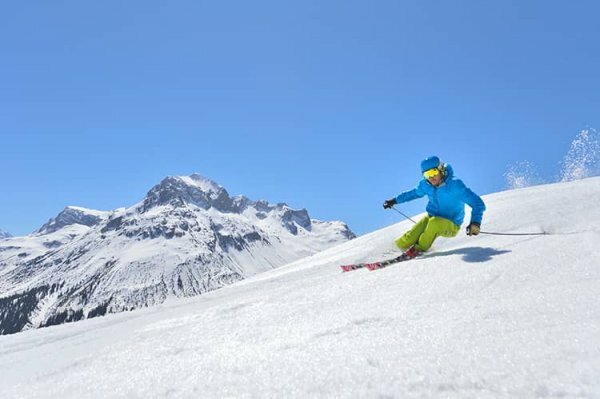 Look forward to Austria’s largest connection ski region, now one of the five largest ski regions in the world thanks to the extension! 305 km of slopes of over 200 km of downhill pistes with incomparable Arlberg powder snow plus several varied fun parks facilitate unequalled winter sport experiences. Guests of the sports hotel Auriga in Lech get their ski pass for the amazing ski region Arlberg directly at reception. The White Ring: half-day circuit with 22 km of easy and intermediate slopes plus 5,500 altitude metres, lookout points on the Rüfikopf and the Madloch, start and finish in Lech am Arlberg. Tip: participate in the annual January race on The White Ring. Run of Fame: new, spectacular full-day circuit with 65 km of slopes and 18,000 altitude entries. This ski circuit with great panoramas is dedicated to the movie and ski stars that have left their marks in the Arlberg snow. Start and finish in St. Anton/Rendl and Warth. Did you know? The Arlberg is the cradle of alpine skiing! Six sportive friends skiing from St. Anton to St. Christoph decided to found a ski club on 3 January 1901, which was to help more people to discover the beauties of wintery Arlberg. This ski club still exists to this day as the world’s most exclusive winter sport club with members coming from all around the world. Skiclub Arlberg already hosted its first ski races three years after its establishment, back when there weren’t any lifts or groomed pistes. Over the course of the following decades, numerous top athletes, some of which even won gold at the Olympics, got their start with this club. No matter when and how many times you want to go skiing while on holiday at the Arlberg, you can easily get your ski pass at the Hotel Auriga reception. How to get your Arlberg ski pass: tell us the name and date of birth of the ski pass holder and pay your ticket plus a deposit fee of € 5 upon pickup. Let’s go! Make use of the option to purchase the Arlberg Safety Card (ASC) with your ski pass. 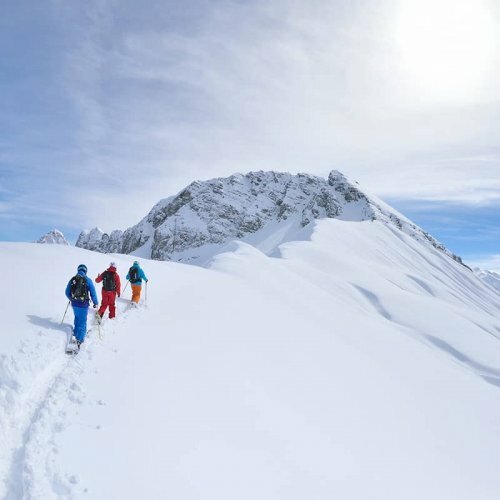 The ASC allows you to claim reimbursement of rescue costs after a skiing accident in the ski region by Ski Arlberg, which frequently can be very high. The price for your financial security: € 15 for up to eight days, € 25 for nine days any more. Always have the most important information and interesting news handy with the Ski Arlberg app, which you can install on your smartphone for free. Orientation in Austria’s largest ski region becomes a piece of cake. Additionally, you can track your skied slope kilometres or locate the next ski hut. Highly modern panoramic gondola and tramway cable cars, two-seat, four-seat and six-seat chairlifts and T-bar lifts quickly transport you to the start of your downhill slope or to the next Arlberg ski region. 131 km easy (blue), 123 km intermediate (red) and 51 km hard (black) ski slopes for beginners, families, experienced skiers and profs are waiting for you in the Arlberg ski region. 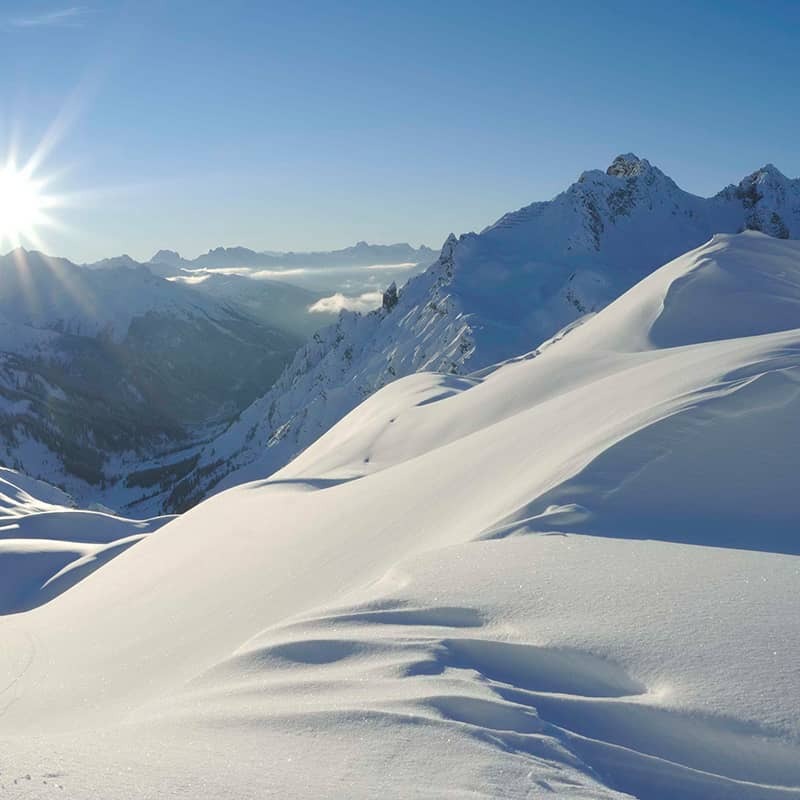 The Arlberg ski region is famous for its gorgeously beautiful deep snow pistes. Enjoy over 200 km of unbelievable downhill in finest powder snow with the ski guide. The Arlberg is rightfully regarded as one of the most snow-reliable winter sport regions of the Alps. Seven metres of snow fall every winter on average. Certainly, more than enough for skiing & boarding. Lots of fun and action in the snow park Lech on the Schlegelkopf, the fun park with freeride garden in St. Anton, on the fun slope Steffisalm & Skimovie in Warth and the fun slope on the Galzig in St. Anton! 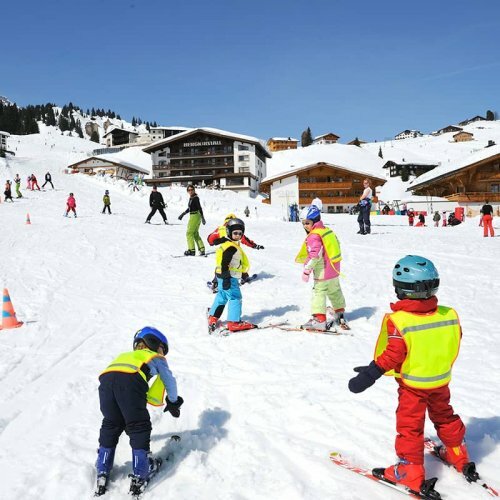 Ski schools with well-educated snow sport instructors are available for you in Lech and all other Arlberg resorts: group and private lessons plus ski guiding. 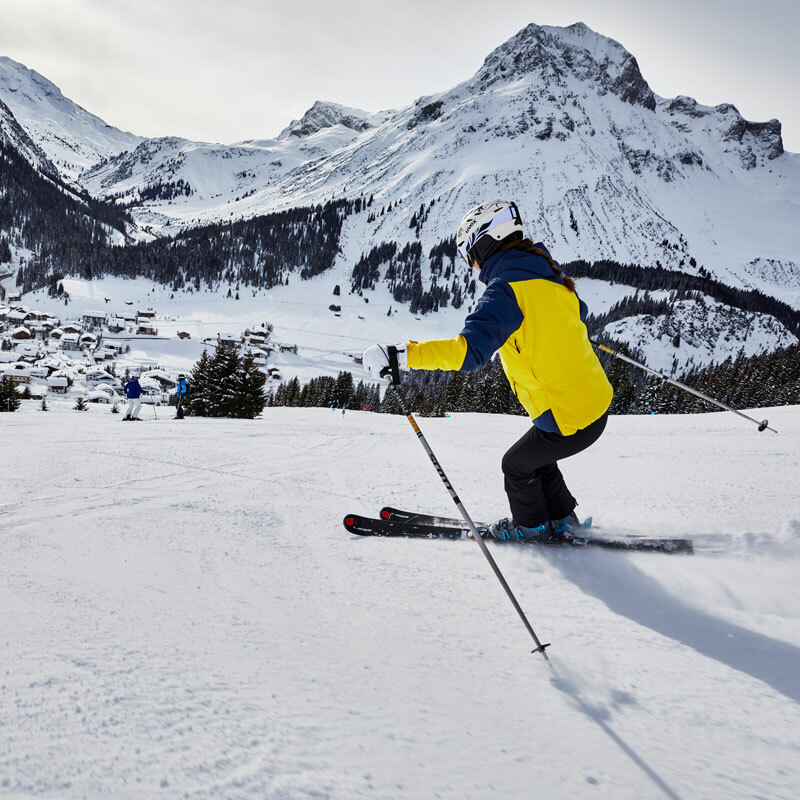 Pick up your ski pass at reception right upon arriving at the sports hotel Auriga, store your equipment in the ski cellar with your personal locker and savour the ski region on the Arlberg from the first to the last minute of your holiday. Lodging, indulgence half-board, spa, underground parking and many other extras are included in the ski offer price. Best book today!